What is the Difference Between the STAG-15 and the STAG-16? 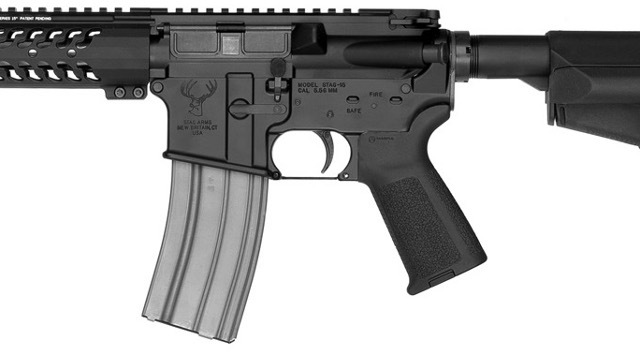 Stag Arms uses the designation of STAG-15 and STAG-16 as rifle designations instead of AR-15 and M-16 due to them being trademarks of another manufacturer. Side by side, the STAG-15 and the STAG-16 look quite similar, to the point that many affirm they are the same rifle with a different name. Nothing can be further from the truth, starting with the fact that the STAG-15, which is targeted mainly at civilian users, is a semi-automatic rifle, while the STAG-16, which is used by police and military, is a select fire rifle which can shoot in a semi-automatic mode, burst mode, or in a fully automatic mode. STAG-16’s and all other select fire, burst fire, and fully automatic firearms have been strictly regulated since 1934 and no new firearms of these types have been permitted for sale to private owners since 1986. Possession of any select fire, burst, or fully automatic parts except for the bolt carrier are illegal unless the firearm is already privately owned and registered with the NFA branch of the ATF.